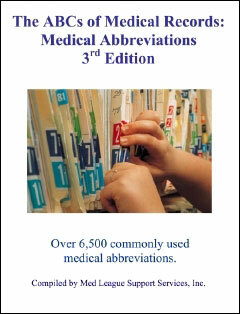 Some of the humorous acronyms and abbreviations found in medical spa charts. If you have an addition, add it as a comment to this post and I'll bump it up. No complaints that physicians shouldn't ridicule their patients. ADR - Ain't Doin' Right. ATSWWT - Always Thinks Something's Wrong With Them. CTD - Circling The Drain. DAAD - Dead As A Doornail. BPC - Botox Poster Child. WICDM - Wish I Could Do More. NMTBD - Nothing More To Be Done. FLK - Funny Looking Kid. FOS - Full Of Stool. FTD - Fixing To Die. DSFD - Doc-Shopping For Deals. GFPO - Good For Parts Only. GGTG - Gomers Go To Ground (they fall out of bed or gurneys). GLM - Good Looking Mom. TYTLFSS - Twenty Years To Late For Sun Screen. GOMER - Get Out of My Exaimining Room. LOLINAD - Little Old Lady In No Acute Distress. MFC - Measure For Coffin. NFFM - Normal For Full Moon. ODD&DDR - Out 'De Door and Down 'De Road. PBBB - Pine Box By Bedside. FFOBR - Forty Feet Of Bad Road. PITA - Pain In The A**. SALT - Same As Last Time. SWAG - Scientific, wild-A** Guess. RTNIFL - Refer To Newbie Internist For Laughs. TOBAS - Take Out Back And Shoot. TTGA - Told To Go Away. WDWNF - Well Developed Well Nourished Female.